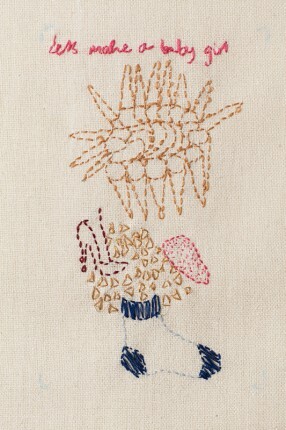 43 Inverness Street is pleased to announce Sampler, the first solo exhibition of Clover Peake. Close the door to the room on the upper floor and you’re inside a private dwelling space. Scan your eyes across the wall and you get hints and whispers, fleeting thoughts and flashes of an internal life. Embroidered works of cotton thread on raw silk cover the wall composed of text and images. They vary from doodles, patterns, edited and scratched out poems, to fragments of phrases. The content within these works, the quick, impulsive, conversational, fleeting throwaway phrases and sketchy drawings, belies the laborious process needed to create them. The flickering thoughts can not be read as a whole narrative but are glimpses of an inner dialogue that the viewer can feel included in for a moment. 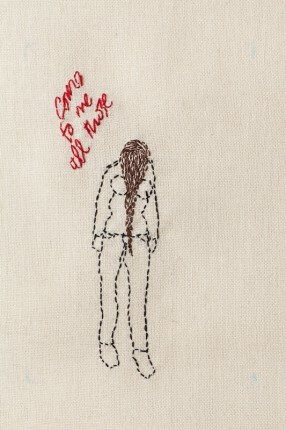 The embroidery process slows down the text so it becomes more pictorial than verbal. This play between word and image resonates more strongly knowing that Peake is a poet and that the title of the exhibition Sampler is a play on words. A sampler in one sense could be the musical instrument that takes fragments of musical recordings to make something new. The word ‘sampler’ could also refer to a tasting menu in a restaurant. Most importantly, samplers are also known as the embroidered sketch pads that many needlepoint artists have made throughout the centuries, a collage of skills and ideas, consisting of lettering and patterns incorporating a variety of thread, stitches and techniques. They are often records of rites of passage such as birth, death, loss, and relationships. Peake’s embroideries function in a similar way and chronicle the private thoughts and images that accompany these themes offering moments of insight. 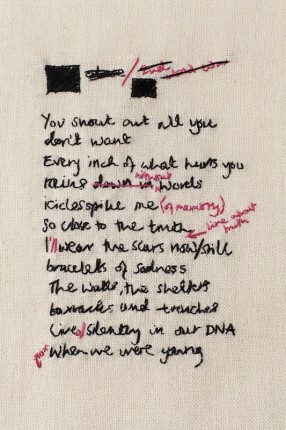 A booklet of Peake’s poems titled Son is produced specifically for the exhibition. Clover Peake is an artist and writer living in London. She has done many readings and is a published poet. She also collaborates with artists providing text for their catalogues. She has worked with text and image for some time which have formed the basis for this exhibition. She offers a special thanks to Eleanor Spalding.